I’m ready very early, six o’clock in fact and wait for my taxi to the airport to arrive. The nice guy from yesterday is also ten minutes early. I offer him to turn off the meter and pay him straight 100k rupiahs, but he insists that the meter running is OK. He is honest – the meter clocks about 93k. I give him the hundred and then another ten. The nice guy has a very good start of the day. Originally, from Surabaya to Semarang I wanted to travel by train. At some point I realised that this will take the whole day and then I saw that the train fare is 300k. It was an easy decision to switch to an aeroplane as the air fare is just 430k. The flight to Semarang is pleasant. I sit next to a lady, who starts chatting with me. This is Liz from Lombok. Liz is very friendly. I learn that she lived in Holland for five years and knows Europe pretty well. We talk about Europe, about Indonesia and about my trip. Liz tells me that she has a villa on the beach and invites me to visit her in Lombok. You never know, we exchange phone numbers. Outside the airport I catch a taxi to the Nusantara bus ticket office, where I hope to get the bus to Wonosobo. Yes, there is a bus just about to depart, but unfortunately this bus is full and the next available would be in the afternoon. I’m not very keen to spend the next five or six hours here. It’s already hot and there is nowhere you could walk/explore, just a dusty busy road. 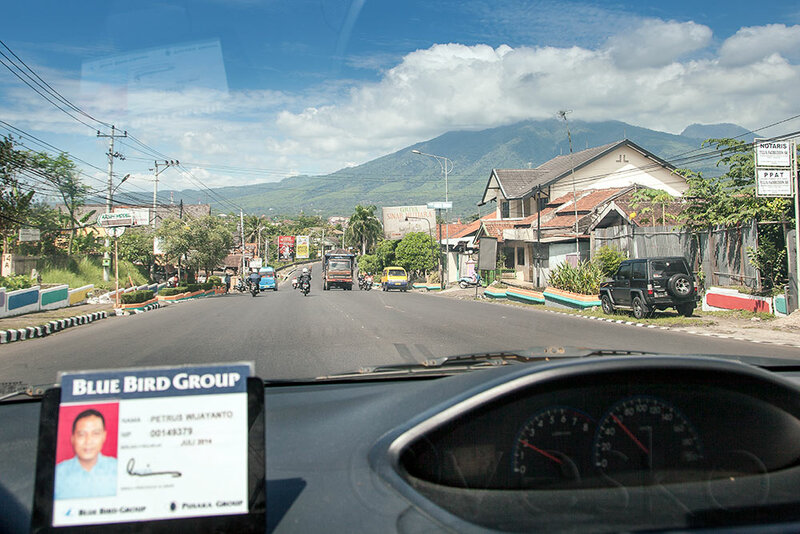 So I negotiate with my taxi driver to drive me to Wonosobo. I’m ready to pay him 500k for the 120 km ride, but he insists to keep the meter on. My driver’s name is Petrus, named after St Peters. Heavy traffic. This is the bus without a seat for me. The ride with the taxi is quite comfortable. 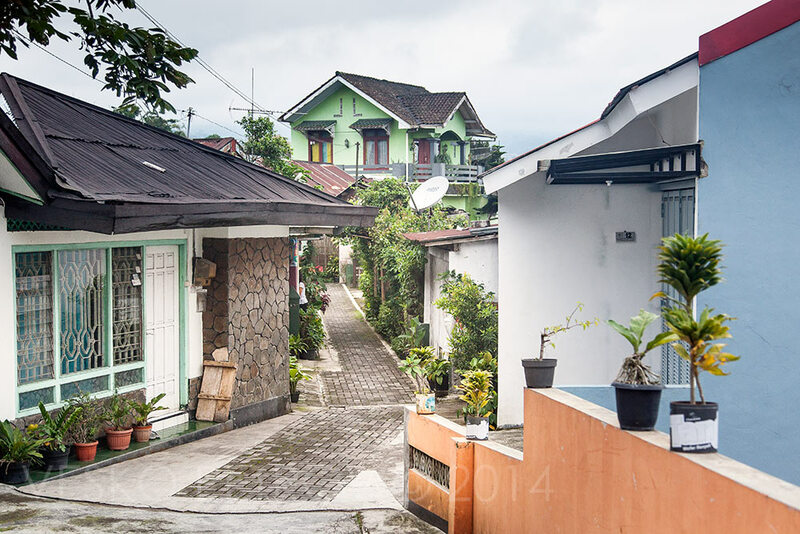 On the way out of town I see that Semarang is hilly and green. It’s a nice town, perhaps I should’ve stayed here the night. Then the countryside opens, but it feels like one continuous village. 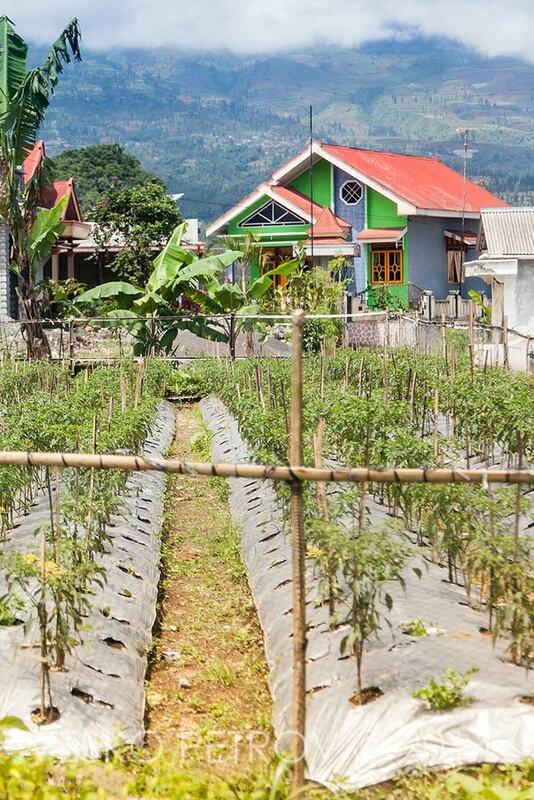 Every available square meter of land is cultivated. Mostly potato, onion, papaya, carrot and cabbage, but also tomato and corn. My driver is called Petros Vijiantu, named after St. Peters. He is one of the few million Catholics in the country. This number sounds like a lot, but the Indonesian Roman Catholics represent only 3.5% of the population. A horse cart we see on the way. 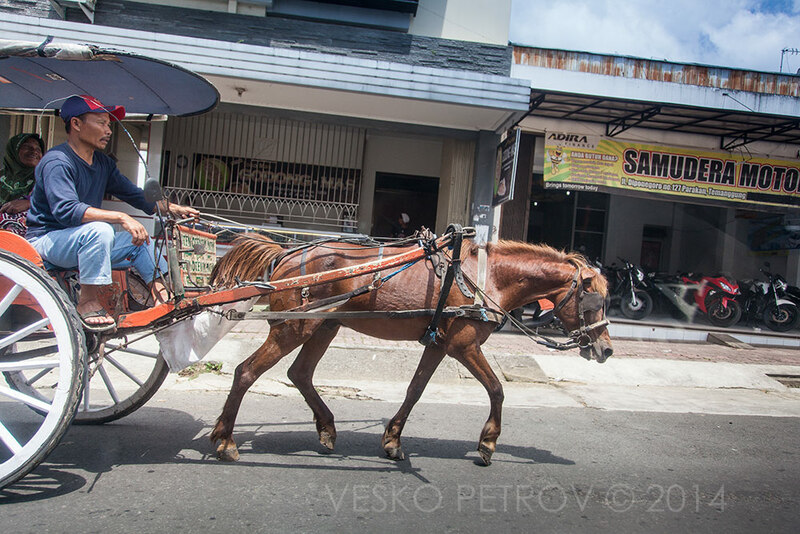 Look at the horse cart driver and the old woman, who is enjoying herself. 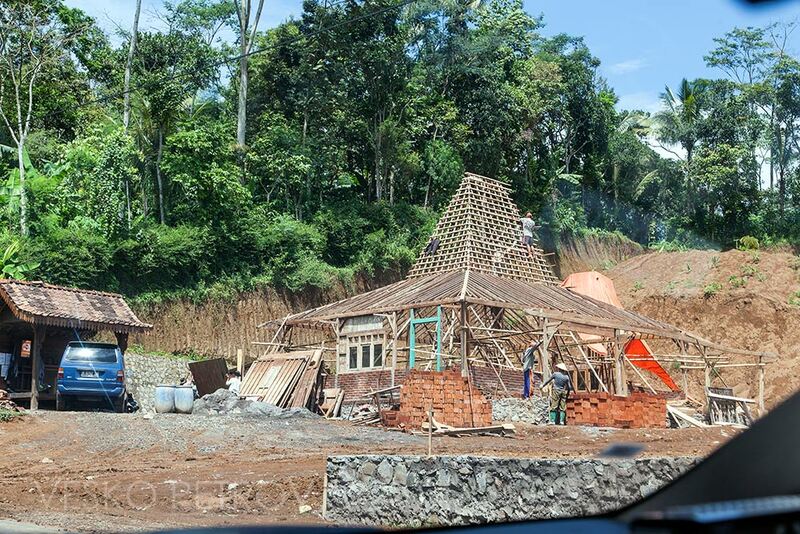 Someone is building a house in the traditional style. I like the smart design of the roof suitable for the tropics. 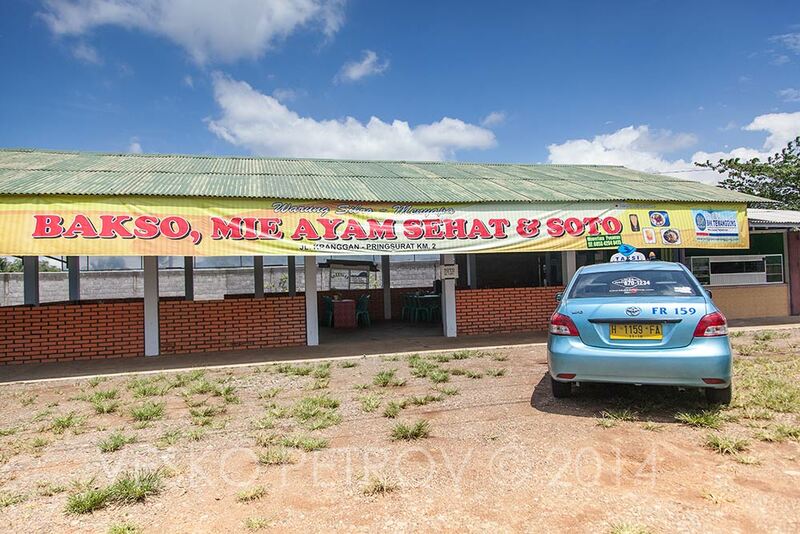 Two thirds of the way we stop for lunch at a roadside eatery. 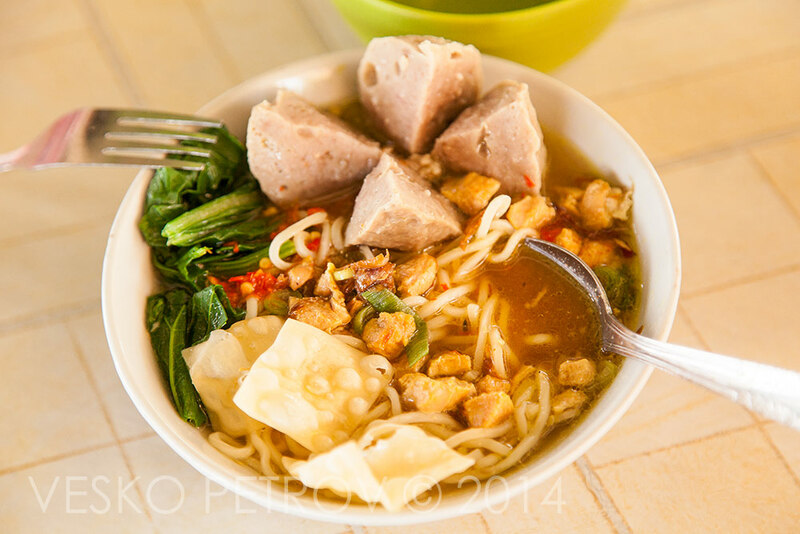 We try their special: bakso soup for 23k. 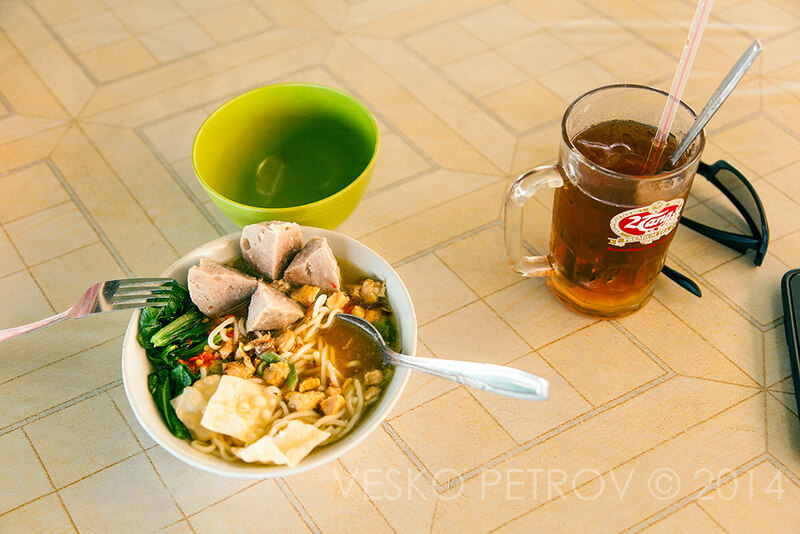 Bakso is traditional meatball noodle soup and I wanted to try it since Surabaya. I am not disappointed, even though I generally don’t like meatball soups. We stop for lunch at a roadside place. I order a couple of Bakso soups. 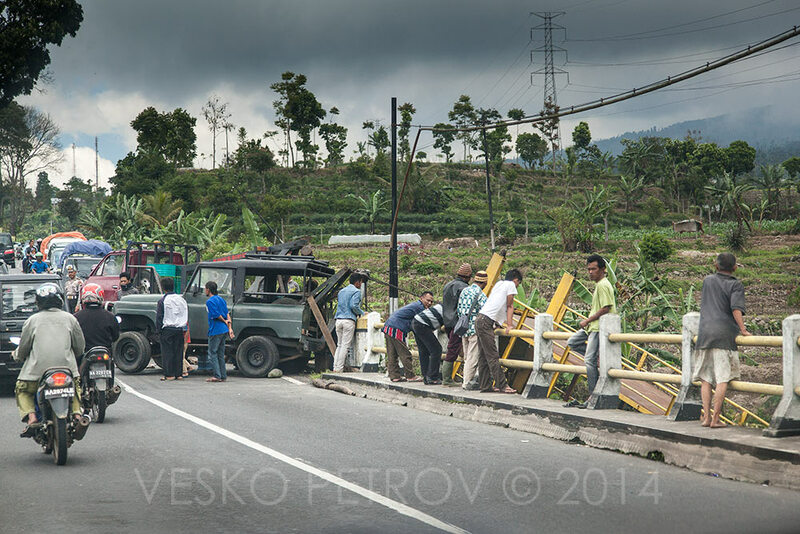 Later we see an accident – a lorry jumped off a bridge. They try to retrieve it. We pass many similar arks, notifying us that we enter the next region or different locality. 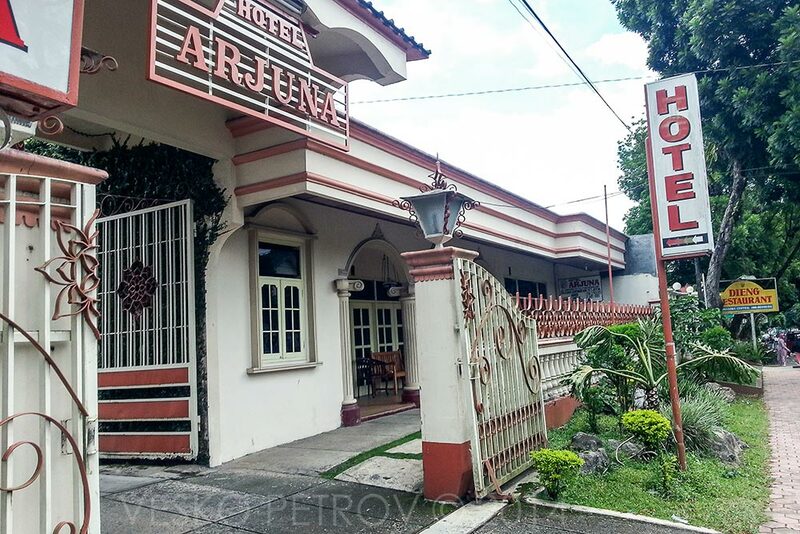 Wonosobo is a small place and we find Arjuna hotel pretty easily. The meter of the taxi shows 430k. Petros is pleasantly surprised when I keep my promise to give him 500k. What the heck, a few dollars. He departs a happy man. I am lucky – Arjuna hotel has available rooms for 140k. I am checked in by a short guy with long curving nails. The room is basic, but it has everything I need, even hot water in the bathroom. So I shower; jump into fresh clothes and rush out to explore the town. There is nothing touristy to see, but I enjoy a long stroll around the town. The people, the shops, the style of the houses look different and everything is interesting for me. 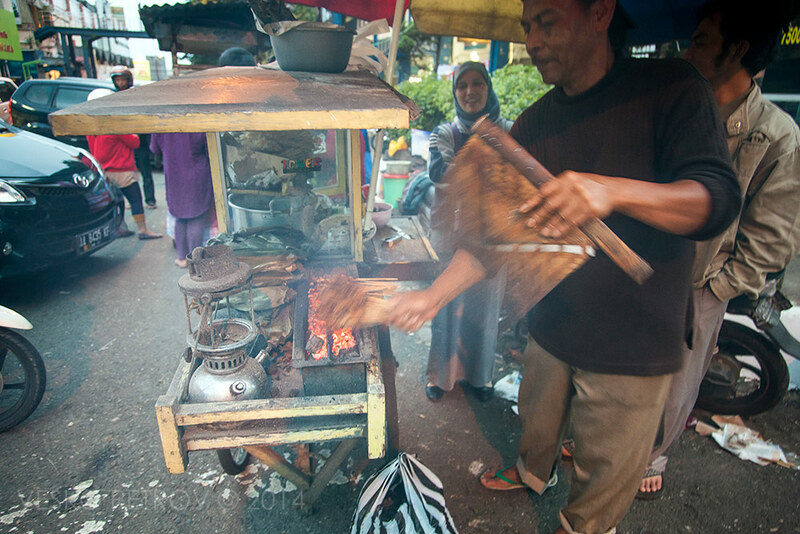 When I get hungry I buy a few satay sticks (the yummy chicken skewers) for 5k. The chicken skewers come with slices of green banana steamed in banana leaf and I enjoy it so much that I come back for another serving. 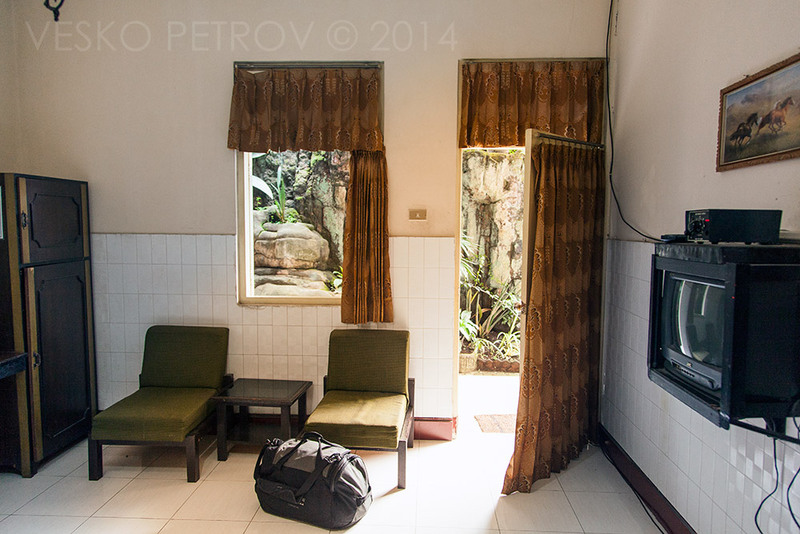 I like my room at hotel Arjuna. 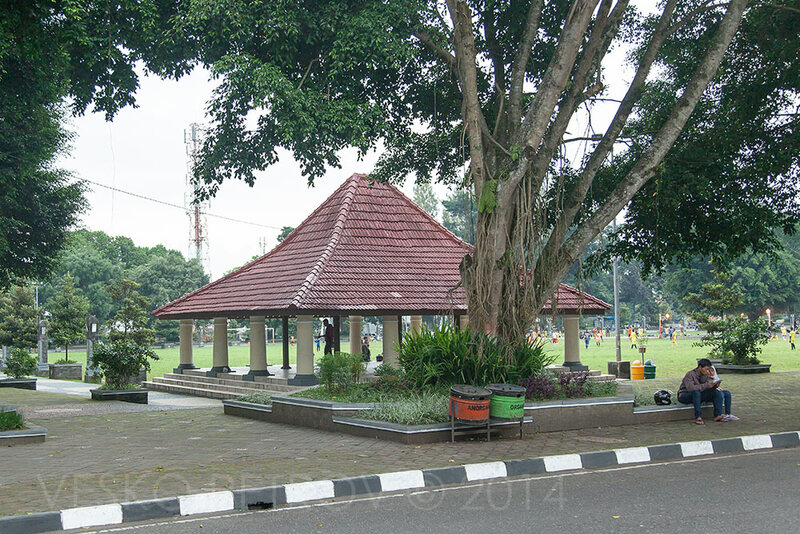 Alun alun at Wonosobo – the local park for sporting activities. 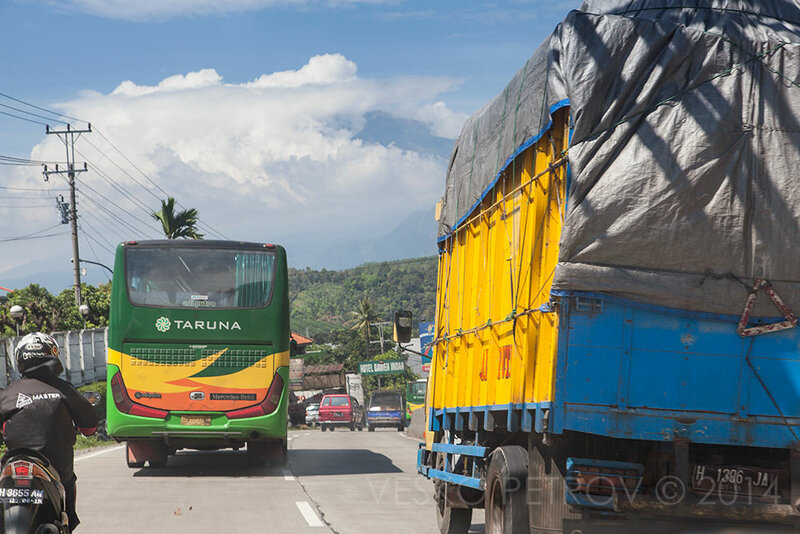 Angkot – the minibuses at the heart of the Indonesian transport system. 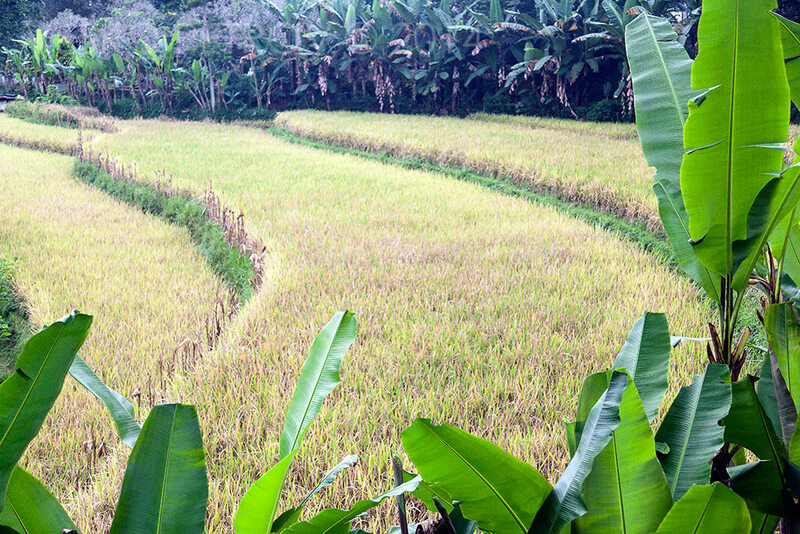 Some rice fields at Wonosobo. 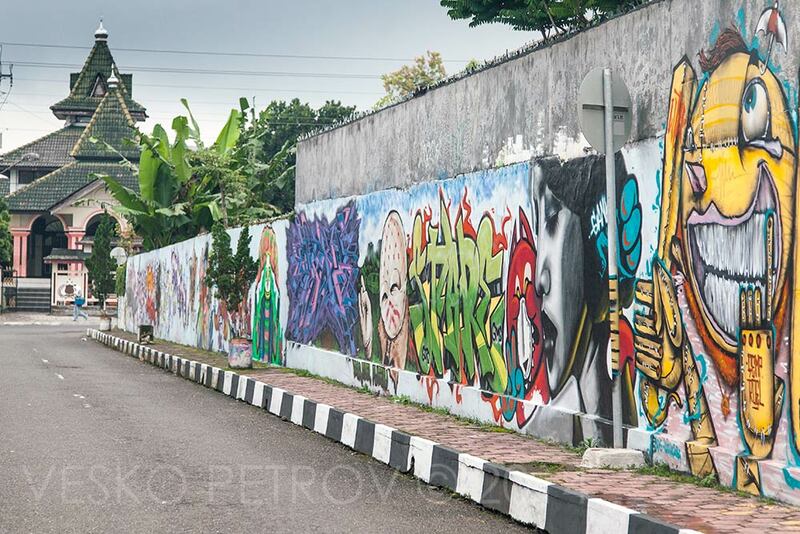 Graffiti at Wonosobo?! Nearby I will find a youth centre for indoor football. Clicking on this image will show you a bit of the indoor football I watched for a while. Chicken skewers – Sate Ayaml. Later, on the way back to Arjuna hotel I see a restaurant specialising in roast duck and cannot resist. 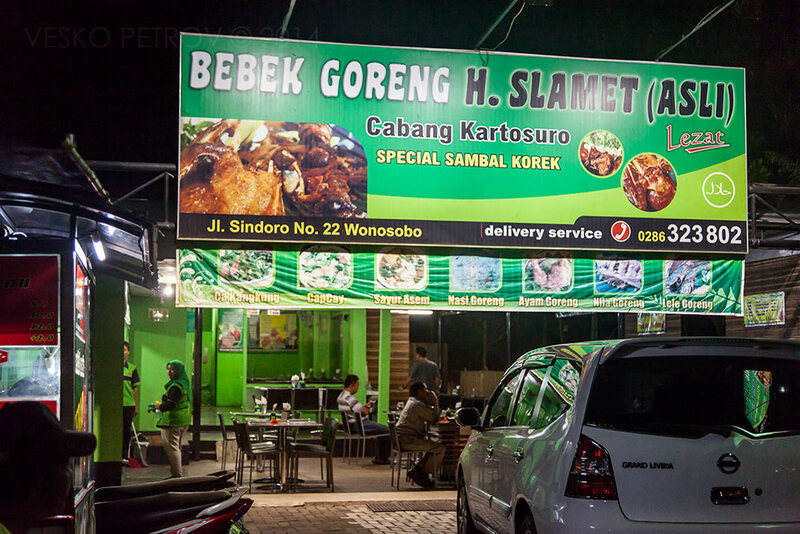 I order Cah Kangkung (seaweed salad) and Bebek Goreng (roast duck). Both are delicious for about 40k with a soft drink. I don’t realise, but the staff of the restaurant has lined up to watching me eat. They obviously enjoy my great appetite. Yet again I learn that one of the best pleasures you can give someone is to show them how much you appreciate their food. This has been the perfect ending of a long and interesting day. 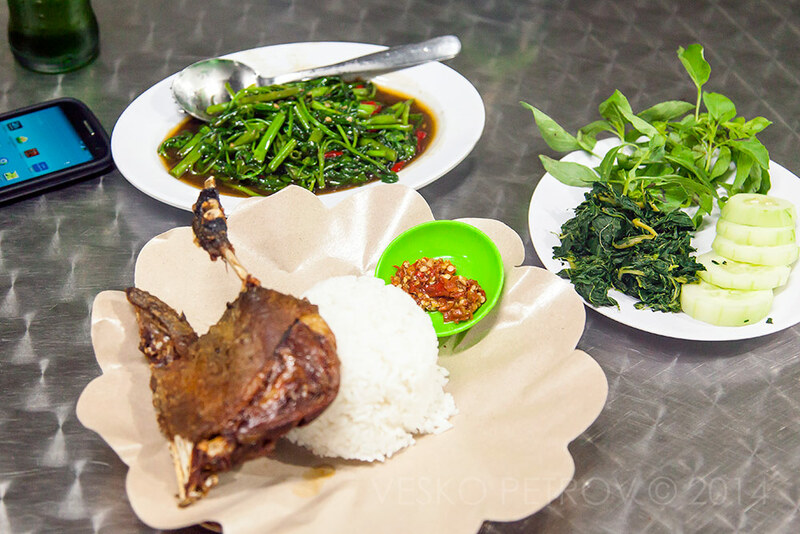 Bebek Goreng – I cannot resist. The perfect finish of an interesting and eventful day. 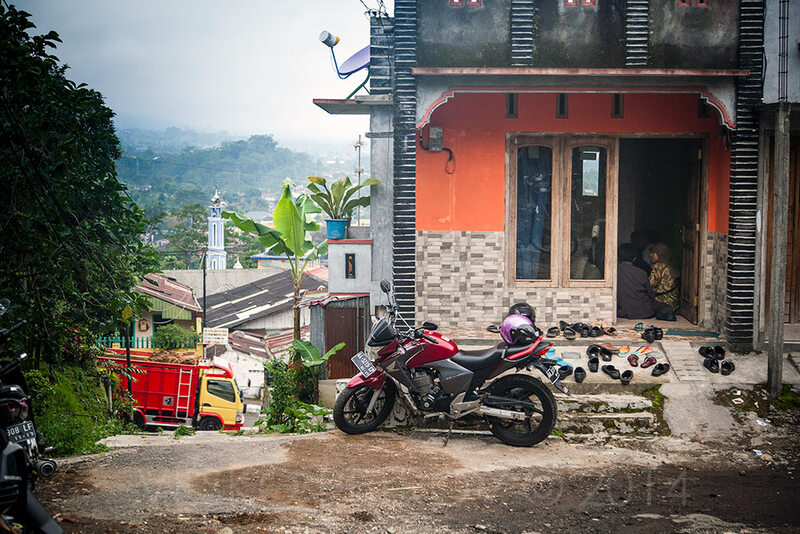 Tomorrow I will explore the Dieng plateau. ааааааа, стига с това скитосване! Марче, няма какво да му мислиш, грабай торбичката и поемай по света.